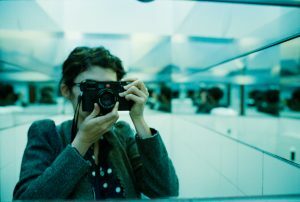 Audrey Tautou (b. 1976, France) hardly needs introduction – she achieved international recognition as an actress for her starring role in the 2001 movie Amélie, and has since become a prominent figure in movies and in our collective celebrity culture. She recently revealed her ongoing interest in still photography with the exhibition Superfacial, comprised primarily of self-portraits in which she plays with the meaning (or lack thereof) behind having an instantly recognisable face. She speaks in this interview about deconstructing the mechanism of fame. ‘Superfacial’ is a word that I invented to express the mechanism of the media world–all these mechanics to become famous. By having a public image, you become a little bit more than human because you have a kind of power, but it’s very superficial because it’s not an effective power. So, to me, the way to express that fame is ‘superfacial’. It’s the virtual power of having a super-face. How did you get started taking still photographs? I started to take photos when I was a child because I was fascinated by Dian Fossey and I wanted to become an explorer. To be a photo reporter in the jungle was kind of my dream, so I got my first real camera when I was 11 or 12 years old, and since then I’ve been taking photos all the time. This project started because I was commissioned to do a self-portrait and an exhibition ten years ago, so I did the self-portrait where I’m in front of a mirror with a fake bra taped onto it. This was the first one, and then a year later, I was asked by a magazine for a second one. It was interesting, because I had also started to take pictures of all the journalists I was meeting, and I had a lot of them, so it made me think about this phenomenon of fame. It was so surprising. This image that I have makes me different from any other photographer, who doesn’t have an image. We know them, but we don’t know who they are. We may know their face but that’s it. But me, that’s different. Me, I can’t escape from this. This is why I wanted to talk about it. How is the experience of working behind a still camera different to working behind a movie camera? It’s more exciting but more painful. I have to deal with a lot of problems and it’s very frustrating sometimes, but when I get what I wanted, the photo I had in my head, it’s so joyful and satisfying. It’s very different. It’s very difficult because I have to deal with so many things; I don’t have any kind of assistance, and I use only objects and accessories that I own and I’m shooting with my own camera in my own intimate places, so I have to adapt my idea to what I have. My idea is to use things which are very intimate to me to create an artificial image. I will always have problems because I’m a self-made photographer. When you are an autodidact, you learn only from your mistakes. So, I learn a lot. Considering you use your personal space and belongings, do you see it more as revealing or performing? I think it’s to destroy the cliché of the star. It’s a kind of game, I do something very intimate to create something very artificial. That’s also a part of the process, because by doing everything by myself, I am breaking the cliché of the star who could be assisted by so many people. It’s a desire for me to be without any artifice. Would destroying the cliché of the star also destroy the power of your face? I don’t want to destroy the cliché of the face, I want to destroy the mechanism of the fame. I want to photograph the little travel that people take in their mind as they look. I’m photographing the way that I feel when somebody is looking at me. Because I know that when somebody is looking at me, he’s coming with his own ideas of who I am, and maybe what kind of life I have, you know? And this little intellectual movement of the viewer, that’s what I wanted to catch. My composed self-portraits are in the middle of nowhere: I’m not a character, I’m not a person, I’m in the middle. I’m a person in mutation, in movement, in transformation. The situations are not natural, there’s a translation. Henri Cartier-Bresson talked about ‘the decisive moment’, do you relate to that? I’m trying to create an instant that seems spontaneous but which is in fact totally controlled. It’s pre-meditated. I’m cheating because I would like them to look like it is a second in a life. 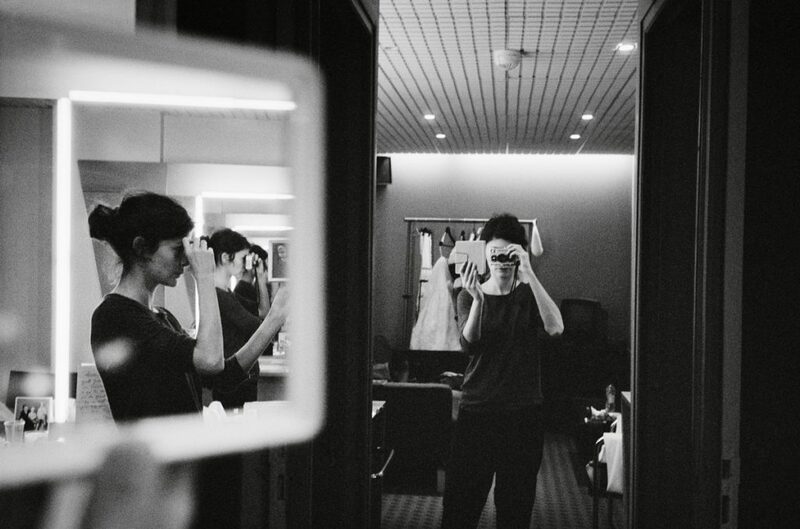 How is the experience of self-directing different to working with a director? Well, a director doesn’t tell you what to do. When you are an actor you come with your proposition, you have your idea of how you want to interpret your character. To me, the director just brings the lack of confidence I have. When I’m doing my self-portraits, I just have to trust myself, and that’s much more difficult for me. It’s a question of confidence. When I shoot a movie, I’m surrounded by a whole crew, and when I’m doing my photos I’m really only by myself. I couldn’t shoot photos with somebody else in the same room. This is a good question but it’s a question I can’t answer. Because I have no idea why I feel this necessity to do those photos. The emotions I have when I’m working on them are so powerful. I feel much more in danger when I’m taking a photo. 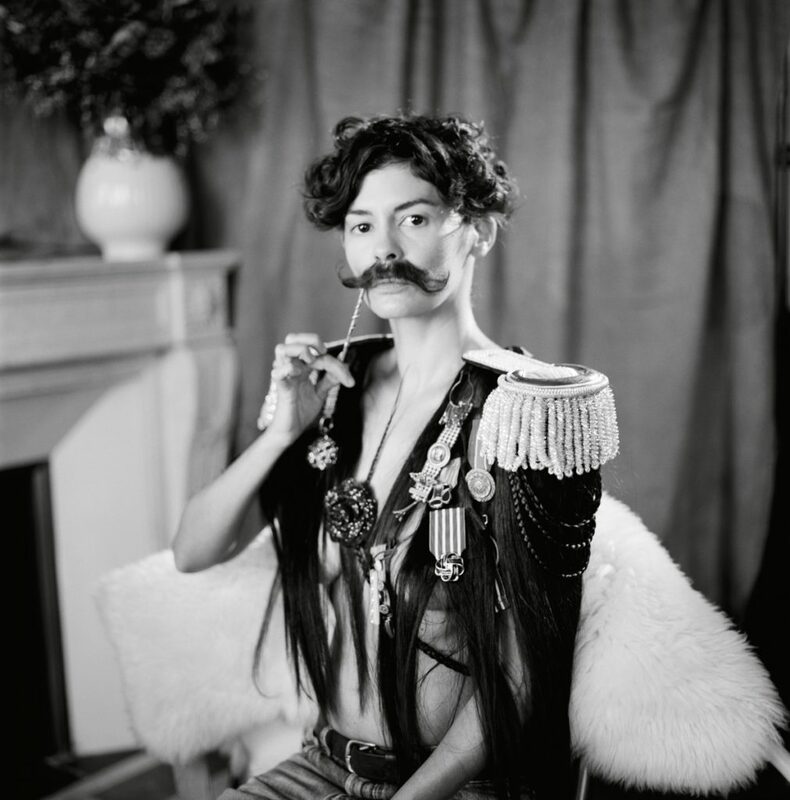 This interview with Audrey Tautou was first published in GUP Magazine #56, the Transition issue. Superfacial was first exhibited at Les Rencontres d’Arles 2017 in France, and again at the Jimei x Arles International Photo Festival in China.